While Internet has connected businesses all over the world, it has not only changed the way businesses interact with each other but also brought a change in the relationship between suppliers, buyers, dealers etc. It has also given rise to the trend of conducting business from homes, benefitting Small Offices/ Home Offices (SoHos). There are a number of entrepreneurs who are doing business from the confines of their personal space. Since SoHos work in isolation, they tend to face constraints of reaching out to large segment of business partners in one go. They have to make extra efforts, pool in finances to travel and meet their prospective business partners to generate business. Limited availability of resources such as budget, manpower, infrastructure, et al limits their growth prospects. In such a scenario, the Internet, especially online B2B marketplaces like IndiaMART.com play a significant role in facilitating business for them. 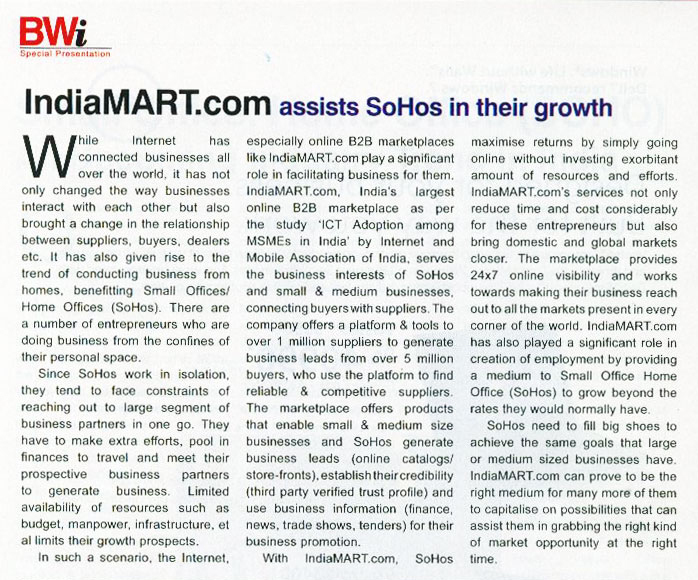 IndiaMART.com, India’s largest online B2B marketplace as per the study ‘ICT Adoption among MSMEs in India’ by Internet and Mobile Association of India, serves the business interests of SoHos and small & medium businesses, connecting buyers with suppliers. The company offers a platform & tools to over 1 million suppliers to generate business leads from over 5 million buyers, who use the platform to find reliable & competitive suppliers. The marketplace offers products that enable small & medium size businesses and SoHos generate business leads (online catalogs/store-fronts), establish their credibility (third party verified trust profile) and use business information (finance, news, trade shows, tenders) for their business promotion. With IndiaMART.com, SoHos maximise returns by simply going online without investing exorbitant amount of resources and efforts. IndiaMART.com’s services not only reduce time and cost considerably for these entrepreneurs but also bring domestic and global markets closer. The marketplace provides 24×7 online visibility and works towards making their business reach out to all the markets present in every corner of the world. IndiaMART.com has also played a significant role in creation of employment by providing a medium to Small Office Home Office (SoHos) to grow beyond the rates they would normally have. SoHos need to fill big shoes to achieve the same goals that large or medium sized businesses have. IndiaMART.com can prove to be the right medium for many more of them to capitalise on possibilities that can assist them in grabbing the right kind of market opportunity at the right time.